If there was one elixir that Karen and I could say has more benefits than any other, it would have to be Apple Cider Vinegar (ACV). Vinegar may help you lose weight by increasing satiety and reducing total amount of food consumed. The acetic acid suppresses your appetite, increases your metabolism, and reduces water retention. Apple cider vinegar has antibacterial properties so gargle with a mixture of 1/3 cup ACV mixed with warm water. Acid Reflux typically results from having too little acid in your stomach. Improve the acid content of your stomach by taking one tablespoon of raw unfiltered apple cider vinegar in a large glass of water daily. If a bacterial infection is at the root of your diarrhea, apple cider vinegar helps thanks to its antibiotic properties. 1 teaspoon of ACV is enough to stop hiccups asap. Apple cider vinegar helps kill odor-causing bacteria. Pour some ACV into a small spray bottle and spray underarms as a natural deodorant. Vinegar is one of the best cleaning agents around the home too. Acetic acid kills E. Coli while lemon juice and vinegar kill salmonella. NOTE: Apple cider vinegar is not the same as Distilled white vinegar. The distilled vinegar is great for cleaning and laundry not for drinking. Vinegar is important for including in homemade bone broth. When it comes to making broth, the vinegar helps leech all those valuable minerals from the bones into the stockpot water. 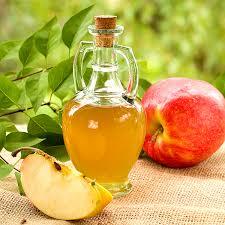 Apple cider vinegar helps remove product build-up in your hair and balance your scalp’s pH level. A weekly rinse of 1/3 cup of vinegar mixed with 4 cups of water will help to remove the build up of prays, gels, etc…. For dandruff, spray your scalp with equal parts vinegar and water (mixed), wrap a towel around your head, and leave it for an hour. Then, wash out and repeat up to twice a week. There are many more benefits…you’ll just have to Google them. 1 Diabetes Care. 2004 Jan;27(1):281-2. 2 J Am Diet Assoc. 2005 Dec;105(12):1939-42. Quite possibly an ignorant question, but I can’t seem to find a satisfying answer online – how serious is the expiration date on ACV? I found a case or organic that had gotten misplaced in a move and it’s expired, but I really hate to throw it away!